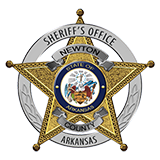 Sheriff Keith Slape said that the Newton County Sheriff's Office is investigating two commercial burglaries. Slape said that on May 9th that the Western Grove IGA was broke into and that an ATM was drilled into and approximately $400 was taken. On May 13th the Eagle Rock Cafe in Mt. Judea was burglarized and approximatley $500 in cash and several cases of food items was taken. "We're developing leads at this time and do not feel that these crimes are related" Slape said.